Lets not make this about Donald Sterling, formerly Tokowitz, an indignant, proclaimed proud man of the Jewish faith unaccepting of even his own. The man who said that “black Jews” are naturally inferior to “white Jews” based on a stubborn, unilateral outlook on society. A man who blames the system of status quo, an excuse to ignore a systematic thirst for progress. Lets not make this about an unapologetic, unequivocal, narcissistic racist who wholeheartedly lives his life with a plantation owner mentality. A man who proclaims to provide life and opportunity for African American basketball players making a rich man richer, ripe with justification for his actions and state of mind. Maybe he feels remorse. We can't know. He has yet to speak. Maybe he feels guilt, a semblance of shame. Lets praise the solemn; the protagonists; the doers; the fixers. Those who kept calm under a manic three days of (justified) overreaction and scrutiny of a sports league that, historically, has one of the best public relations teams the world has ever seen. 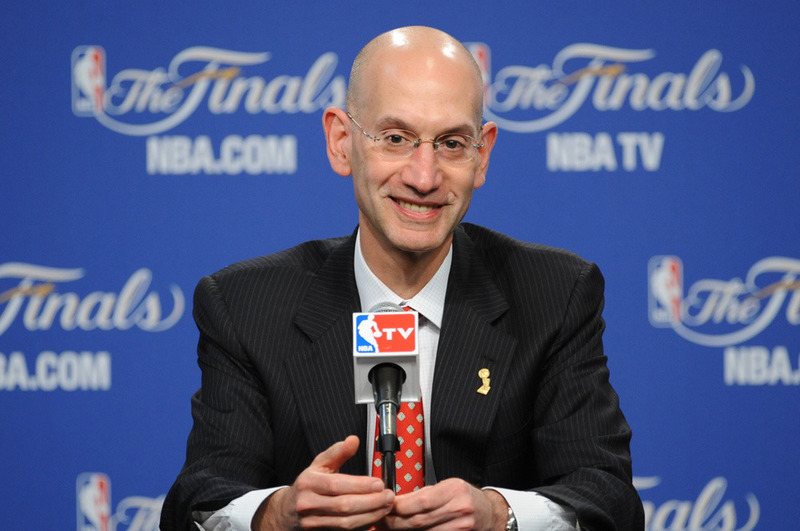 Hats off to Adam Silver—shall we start there? True, he's been employed by the NBA since 1992: Special Assistant to the Commissioner David Stern, President of NBA Entertainment, heck, an executive producer for “Like Mike”. The man who pushed for Lil Boww Woww's acting career served one of the swiftest and harshest penalties in NBA history. And he's been Commissioner for three damn months. And his first major test was certainly a prolific and opportune time to absolutely destroy the gigantic ego of a fanatic bigot. Donald Sterling has been banned for life. As Lisa Guerrero so eloquently phrased it – the “racist slumlord” cannot attend any Los Angeles Clippers, or any NBA games. He cannot be present in any NBA affiliated building. He is effectively paralyzed as an owner—a lame duck—his livelihood, his creation has been ripped out from his horrible grasp, or any negative connotation you'd like to stick to his wrinkled, antiquated-viewed being. And we're all grateful for it because it was the only outcome that would satisfy every right-minded human being in this country. Speaking of right-minded human beings: let's give credit to the players—those directly involved like the Clippers players, and specifically Chris Paul, who happens to be president of the NBA Players Association. It was a pleasant under reaction to a situation almost pleading for an explosion of emotions. A symbolic gesture; a small but fitting attempt to show solidarity as players. The pile of jerseys, the inside out warm up shirts. The black socks, wristbands, and headbands. Strictly a simple and emergent response to an abhorrent situation. The outpouring of support from players of other teams was expected as well. The pile of jerseys, the inside out warm up shirts. The black socks, wristbands, and headbands. It was righteous. It was tender. It was important. Importance peaks and flourishes when it is enabled. And thank goodness the Clippers have a leader to enable that righteousness to take place. If ever there was a coach most fit to take on the task of this harsh endeavor, it'd be Doc Rivers. Prominently featured as one of the most respected figures in the NBA, Rivers took the best possible action with his players handling of the situation: indifference. He wasn't with or against and protest against Sterling. He simply existed as a solid force and figure. He made his disgust known and let the players be free to make their own course of action as long as it didn't interfere with the game. And they chose action. Players, current and former alike, took action. The first response by Adam Silver sure was a poignant one. There was no tedious mining of speculative details from multitudes of parties. There was no unimaginative subpar reactionary implementation of unnecessary outcries. There was appropriate and dignified action by those who have the ability to enact change and improve social responsibilities both symbolically, through sports, as well as in the context of humanity and its progress as a whole. There is certainly no place for this man with, as he puts it himself, an “evil heart” in the NBA. With a 75% majority, or 22 out of the remaining 29 owners, Sterling can be removed as owner of the Clippers. Though only 75% is required, it must be unanimous for the sake of the league. For the owner that votes in favor of keeping Sterling is certainly doomed as well. Lets hope the votes are public, as Jeff Van Gundy alluded to in the post presser segment. It is uncertain what the response from the Sterling camp will be. He may fight and try and go to court, though it wouldn't reach litigation. He may walk off into the sunset with his one billion plus dollars the team is sure to fetch. Time will tell, but for now his destiny lies in the hands of the other 29 owners who can get this process started. How fitting would a Magic Johnson ownership of the Clippers be? Slighted and demeaned by the very man who's job he may soon have. It could be a reality soon, as Magic and his Guggenheim group have showed significant interest. Regardless of who the new owner is, the fact remains that, on these historic days in the NBA and throughout the sports world, the good and common sensed can oust the nasty and narrow minded. Donald Sterling and his long life of bigoted behavior will exist without his pride and joy. The object of livelihood he worked for so long to make valuable. His Clippers are no longer his. Donald Sterling is banned from the NBA for life.